In this highly detailed, suspenseful thriller, an intense and misunderstood seismic event west of the Andaman and Nicobar Islands triggers a larger global disaster in the making that must be stopped before it leads to mass extinction. The initial upheaval, later dubbed the Andaman Event, results in a second massive tsunami at the same resort site in Kaoh Lak, Thailand, where a disastrous tsunami hit 15 years earlier. By 2020, something mysterious begins knocking out the world’s key weather satellites. Simultaneously, violent weather is unleashing massive death and destruction. When the weather satellite designers link the problem to a surprising phenomenon, they are alarmed and hurry to notify the White House. Without warning, their knowledge of the problem’s source makes them a target by the very people they thought they could trust. A more sinister plan develops to protect the United States as the book ends—to be continued in part two. Briskly paced and fluidly written, this book is captivating for its inventive plot and gripping scenarios involving a globally wide range of people in dire situations. Vivid details have depth, color (and, sometimes, gruesomeness, as in the aftermath of an unexpected freak hailstorm in Sydney, Australia, where people become frozen into giant balls of ice: “An open hand with its fingers partially curled reaches up through the hail, and the white surface . . . is stained with red where the warm blood has seeped through from underneath before congealing”). Rigorously researched, the story doesn’t shy away from complex yet necessary scientific detail throughout. In a partial explanation of what has transpired, it notes, for example, that “the earth’s obliquity to the ecliptic (the angle of the earth’s axis) is typically twenty-three point four four degrees.” Happily, the science is adequately explained so that readers don’t get lost. 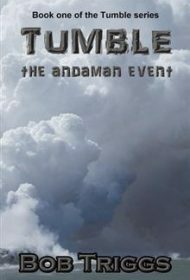 Overall, this captivating and unsettling novel delivers attention-grabbing drama sure to delight disaster book junkies. Readers will eagerly await the sequel.